If you aren’t as comfortable in your car as usual, you might need an auto air conditioning repair. For this, trust your vehicle to the A/C experts at Mode Automotive. With more than 6 years of experience, our staff will get your auto air conditioning repair completed swiftly for a comfortable drive at any time of year. At Mode Automotive, we pride ourselves on our Exceptional service, including our auto air conditioning repair work. Our technicians are ASE-Certified with the training and experience to restore your vehicle’s A/C to peak performance, no matter what ails it. High-tech equipment diagnoses the root cause of the symptom, from which our industry-approved repair methods correct it. 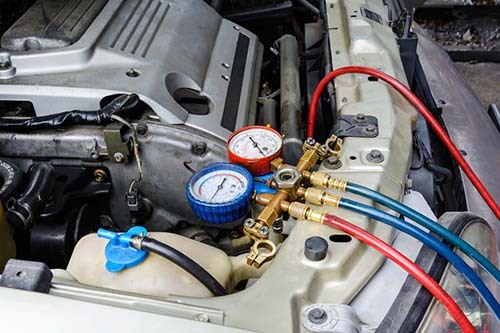 Whether your Plymouth needs a new A/C compressor, your Pontiac requires a new evaporator, or your Acura simply needs a refrigerant recharge, we’ll do it for you accurately. Because we know you don’t want to make repeat visits for the same concern, we always use top-shelf aftermarket and OEM parts, backing them with a 1/12000 warranty. For trusted auto air conditioning repairs in San Diego and across San Diego County, visit Mode Automotive. Call us today or use our convenient online form to book your visit.